After a month-long family crisis that ended in a bittersweet manner, we headed for our Hill Country hideaway for a long weekend of regenerative relaxation. We looked forward to a time of recuperation, both emotional and physical. But, you know what they say about telling God your plans. Here's a hint: don't. Our first indication that things might not play out exactly as we hoped came almost as soon as we walked through the door, when we discovered that our satellite-connected TV displayed the dreaded blue screen indicating no signal. MLB spent a half hour on the phone with DirecTV lack-of-support, booting and rebooting the box to no avail, while being assured that there was no apparent problem with our dish. She finally had to schedule a service call, which couldn't happen for a week. There was a two-foot gap in the cable running from the satellite dish into the attic. 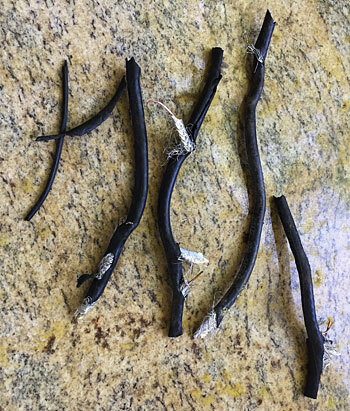 The cable hadn't just been severed...it had been annihilated, as if a band of marauding mutant squirrels with titanium teeth had gone medieval on it. Of course, there was also the [more boring] likelihood that the lawn service had shredded it with a mower. I'll confess that I have never tried to splice a coax cable. Unlike speaker wire that's drop-dead simple in construction, coax is mysterious and finicky, and repairing it requires special tools, connectors, and expertise; I was 0-for-3 in those areas. This was a challenge I was unprepared for, but faced with the possibility of four days of nothing but conversation, I was motivated to conquer it. The first order of business was to solve the tool and connector crises. I turned to that trusty stalwart companion of every inadequate DIYer, the Home Depot, and found this coax repair kit. These tools would allow me to put connectors on the ends of the severed cable. I also bought a short length of ready-made coax, and a couple of splice connectors. I then found a YouTube video explaining the intricacies of arcane art of coax repair. Along with the printed instructions that accompanied the tool kit, I now possessed the knowledge to do the job. Probably. Possibly. Well, we'd soon find out. Taking a tip from the aforementioned video, I stopped by Ace Hardware and picked up some heat-shrink tubing to weatherproof the new connections, which would be reburied once the repairs were made. I found some old coax in the attic and made a couple of practice runs with the tools to make sure I understood the repair process. The process was a lot easier than I expected; it's really just a matter of having the right tools for the job. Satisfied with the results, I moved over to the severed cable and...discovered a complication. Surprising, right? That never happens. It turns out that the satellite coax has a ground wire running its entire length. That makes sense, and I suspect it's actually required by local building codes. But the coax I got didn't have the associated ground wire. So, off again to Ace to get a spool of copper wire to splice the ground wire. Fortunately, our local store is well-equipped and had just what I needed. Back to the cable repair. Enduring the 90-degree heat, high humidity, and hungry mosquitos, I managed to affix new connectors to the severed cable, insert the coax splice with the adapters, and add the ground wire splice. I used a butane lighter on the heat shrink tubing to seal the connections, and wrapped the entire length in heavy-duty, weatherproof electrical tape. It was time to find out if I passed the coax repair initiation test. I turned on the TV in the living room while MLB turned on the one in the bedroom. "We have a picture!" she yelled from the bedroom. However, the living room TV still had no signal. It took only a quick reboot of the box to remedy that, and we were back in business. This was a small but significant victory, and meant that the rest of the weekend would be spent in relaxation and recovery. This page contains a single entry by Eric published on May 11, 2017 1:06 PM. Creating Bike Lanes: A good start...but not enough. was the previous entry in this blog. A "Relaxing" Weekend - Pt. 2: Close Encounters of the Putrid Kind is the next entry in this blog.